Evoluz Translation Services offers professional Urdu translation services for English to Urdu and Urdu to English language combinations. We can also translate Urdu into over 100 other languages. In fact, Evoluz Translation Services has pioneered to be one of the agencies in the industry to translate Urdu to literally any language. Whatever your Urdu translation requirement is, we are confident that our translation team is experienced and qualified to handle the project to your highest satisfaction. Your satisfaction is guaranteed as our Urdu translators have the knowledge and expertise of using the appropriate terminologies needed for documents from different subject areas. We have excellent Urdu project management team and quality assurance editors who can localize any content or document. Our Quality Managers are assigned to specific projects as per their area of knowledge and experience. This will give you peace of mind as your documents are quality controlled by the best in the business. Variety of Services: Our other services in Urdu to English language combination are Urdu interpretation, voice-overs, transcriptions, and multilingual search engine optimization. Urdu (Urdu: اُردوُ, IPA: [ˈʊrduː] ( listen)) is a Central Indo-Aryan language of the Indo-Iranian branch, belonging to the Indo-European family of languages. It is one of the two official languages (the other being English) of Pakistan. It is also one of the 22 scheduled languages of India and is an official language of five Indian states. Its vocabulary developed under Sanskrit, Persian, Arabic and Turkic. In modern times Urdu vocabulary has been significantly influenced by English. Urdu was mainly developed in western Uttar Pradesh, India, which is the seat of Hindustani languages in the Indian Subcontinent, but began taking shape during the Delhi Sultanate as well as Mughal Empire (1526–1858) in South Asia. Urdu is the means of communication between the people from various provinces and regions of Pakistan, and the Pakistanis and Indians too. Due to historical affinities and a large number of Afghan refugees in Pakistan, Urdu is already read, understood and spoken by most Afghan population. Language scholars independently categorize Urdu as a standardised register of Hindustani (literally translated means belonging to Hindustan) termed the standard dialect Khariboli. The grammatical description in this article concerns this standard Urdu. In general, the term "Urdu" can encompass dialects of Hindustani other than the standardized versions. The original language of the Mughals had been Turkic, but after their arrival in South Asia, they came to adopt Persian. Gradually, the need to communicate with local inhabitants led to a composition of Sanskrit derived languages, written in the Perso-Arabic script and with literary conventions and specialized vocabulary being retained from Persian, Arabic and Turkic; the new dialect was eventually given its own name of Urdu. The word Urdu is believed to be derived from the Turkic or Mongolian word 'Ordu', which means army encampment. It was initially called Zabān-e-Ordu-e-Mu'alla "language of the Exalted Camp" (in Persian) and later just Urdu. It obtained its name from Urdu Bazar, i.e. encampment (Urdu in Turkic) market, the market near the Red Fort in the walled city of Delhi. 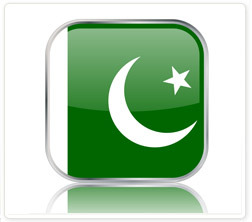 Urdu is often contrasted with Hindi, another standardized form of Hindustani. The main differences between the two are that Standard Urdu is conventionally written in Nastaliq calligraphy style of the Perso-Arabic script and draws vocabulary more heavily from Persian and Arabic, while Standard Hindi is conventionally written in Devanāgarī and draws vocabulary from Sanskrit comparatively more heavily. Most linguists nonetheless consider Urdu and Hindi to be two standardized forms of the same language; others classify them separately, while some consider any differences to be sociolinguistic. It should be noted, however, that mutual intelligibility decreases in literary and specialized contexts. Furthermore, due to religious nationalism since the partition of British India and consequent continued communal tensions, native speakers of both Hindi and Urdu increasingly assert them to be completely distinct languages.